LAW AND INCLUDE UNIQUE PROVISIONS PERMITTING THE DISBURSEMENT OF RENT PRIOR TO TENANCY AND EXPEDITED EVICTION OF TENANTS. YOUR SIGNATURE ON THIS AGREEMENT, OR PAYMENT OF MONEY OR TAKING POSSESSION OF THE PROPERTY AFTER RECEIPT OF THE AGREEMENT, IS EVIDENCE OF YOUR ACCEPTANCE OF THE AGREEMENT AND YOUR INTENT TO USE THIS PROPERTY FOR A VACATION RENTAL. We do business in accordance with the Federal Fair Housing Law (the Fair Housing Amendments Act of 1988) Please make sure that you inspect the cabin photos, description and amenities on our web site, as there is no refund when your reservation has been confirmed, please read our cancellation policy. A Macon County Occupancy Tax of 3% and NC Sales Tax of 8% are added to all Rental Fees. The renter agrees that he will not claim any charge backs or credits from his credit card company for any fees charged to his credit card, including but not limited to booking, deposit, rental, additional cleaning or damage fees. Call 911 for all medical or fire emergencies. After contacting 911 - contact managers (321 2340). On arrival, please report any problems or damages in your cabin the day of check-in to management (321-2340). Amenities are not guaranteed. There are NO REFUNDS for the malfunction of any equipment including but not limited to air conditioning, TV, hot tub, appliances, power outages and telephone service. Every effort has been made to ensure all equipment is in working order before your arrival. All information contained herein is considered to be accurate and truthful. Rates furnishings and amenities are subject to change without notice. In the event a cabin is unavailable for rental due to fire, water damage, acts of nature etc. we will do everything possible to find you equal accommodations. If we are not able to do this all deposits will be refunded. We are not responsible or liable to the renter for loss or theft of any of the renter’s personal property. Accidents, injury or damage of any nature, from any cause to the renter (including guests) acts of God, weather, road, travel or other recreational activities are not our responsibility. Guests hereby agree to INDEMNIFY and hold the owner harmless from any and all claims, including those of third parties, arising out of or in any way related to guest’s use of premises or the items of personal property provided therein. Guests assume the risk of injury or other losses relating to any recreational activities and will hold owner and it agents harmless and respect there to. If Owner/Agent is forced to resort to employment of legal counsel, litigation or professional collection services in the collection of any amounts due to the Owner/Agent under this Agreement the renter shall be responsible for all costs of litigation and collection including but not limited to reasonable attorney’s fees if Owner/Agent prevails in legal action. The renter is responsible for abiding by all rules, regulations and instructions in this Vacation Rental Agreement. Any exceptions to the above mentioned the Owner/Agent must approve rental agreement in writing in advance. Property owner or their representatives have the right to enter premises during tenancy to inspect, make repairs or show property for sale. We wish to thank you for adhering to our policies, we have had the pleasure of renting our cabins to our wonderful guest since 2000 and we are pleased to say because of their consideration and understanding the cabins are still in a as new condition. Due to the nature of our business, we require a minimum of 30 days’ notice in order to give a full refund less a $50.00 cancellation fee. If you must cancel your reservation within 30 days of arrival and we are able to re-rent the cabin, we will be happy to refund all monies paid less the $50.00 fee. If we don’t re-rent the cabin, the monies paid will not be refunded. No refunds will be given for early departure for any reason, including weather conditions or anything resulting from severe weather conditions. We recommend you look on the Internet and purchase Trip Insurance to cover any potential financial loss. Here is a link to Travel Guard a travel insurance company. Check-in time begins at 3:00pm – While we make every effort to have your cabin ready, there may sometimes be a delay during peak season and your patience is appreciated. Checkout is no later than 11:00am – An additional night’s stay will be charged for late checkout after 12:00pm. On departure guests are required to leave the property in the same general condition it was when guests arrived. If additional cleaning is required appropriate charges will be charged to your credit card or checking account. Mountain roads can be tough at any time of the year. We do not guarantee any road surface conditions. Most roads in our area are well maintained, but they can be curvy and steep. Our cabins have gravel drives and while these roads are routinely maintained, they may be bumpy at times. In the late fall, winter and early spring it is not uncommon to occasionally have hazardous road conditions, a four-wheel drive is advisable. No refunds due to road conditions. You are responsible for your transportation. We are not responsible for any towing charges you may incur during your stay. If provided at your rental cabin -the hot tub is NOT part of the rental terms, it is provided for your enjoyment free of charge, and therefore you enter the hot tub at your own risk. Please read spa/hot tub warnings and instructions before use and it will also be sent with your check-in information. Hot tubs will be inspected after each rental. If any items such as food, alcohol, soaps or bath products etc. are found in the hot tub, you will be charged an “empty and refill” fee of $50. Do not sit on the hot tub cover, it is made of Styrofoam and breaks easily. Damage to any cover can result in a $200 charge. Covers should ALWAYS remain on the hot tub at all times when not in use, failure to do this will result in a 'Re-heat' charge of $35.00, this will be charged against your credit card. 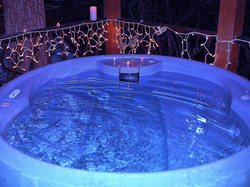 Children under the age of 16, pregnant women and persons on medication or with heart conditions or skin sensitivities are not to use the hot tubs. DO NOT sit in the hot tub longer than ten minutes it is bad for your health. D0 NOT HAVE TEMPERATURE OF HOT TUB HIGHER THAN 102 DEGREES, IT WILL BURN OUT THE HEAT PUMP. The total number of guest are confirmed during the booking procedures, you are reminded that this is part of our rental agreement, a copy of which will be presented to you on your arrival. The office must be notified of additional guests and permission APPROVED before your arrival, failure to disclose additional guests will result in the termination of the rental contract and NO refunds will be issued. No mobile sleeping units, including tents are permitted at the cabins for additional housing. Smoking inside the cabin is not permitted. You may smoke outside on the deck, please ensure you extinguish all cigarettes and dispose of them properly to prevent fire hazard and keep the grounds clean. If guests smoke in the cabin a $100 charge will immediately be deducted from your credit card for deep cleaning of curtains etc. Any cigarette burns inside the cabin will be charged on an individual basis, depending on what item is damaged. If a fire pit is available at the cabin no other area is to be used for a campfire except the fire pit provided. ALWAYS put out your fire before returning to your cabin or leaving the premises. Please remember that fire is a threat to the area. It is your responsibility to ensure your fire does not get out of control, you will be held personally and financially responsible if the fire gets out of control and results in damages of property and land. Your TV and DVD will be checked on your arrival, both remotes have been preset for your enjoyment, DO NOT adjust the settings of any of the equipment or remove the batteries during your stay; if we have to call out an engineer to reset any of the remotes there will be a $50.00 call out charge deducted from your CC, we thank you kindly.